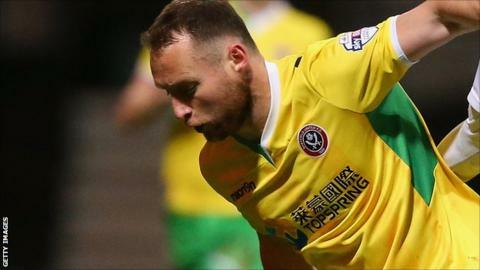 A last-minute Ben Davies penalty earned Sheffield United victory over South Yorkshire rivals Rotherham. With one eye on their FA Cup semi-final against Hull on Sunday, Blades manager Nigel Clough made eight changes to the side that drew 1-1 with Leyton Orient. And his young side won it at the death, when Davies slotted home from the spot after Millers defender Craig Morgan clattered Harry Maguire. The result brought to an end Rotherham's 16 game unbeaten run. It also means Steve Evans's side are now nine points off the automatic promotion places, after second-place Brentford beat Crawley. Sheffield United remain 11th, eight points off the play-off places with five games left to play. It was in-form Rotherham who had the best efforts on goal in the first half, but James Tavernier and Tom Hitchcock were both denied by keeper George Long. Alex Revell then headed straight at Long and also put a thumping drive wide. The visitors had two penalty appeals waved away just after the restart and in the end it was the Blades who found the winner. Match ends, Sheffield United 1, Rotherham United 0. Second Half ends, Sheffield United 1, Rotherham United 0. Goal! Sheffield United 1, Rotherham United 0. Ben Davies (Sheffield United) converts the penalty with a right footed shot to the bottom right corner. Craig Morgan (Rotherham United) is shown the yellow card. Penalty Sheffield United. Harry Maguire draws a foul in the penalty area. Penalty conceded by Craig Morgan (Rotherham United) after a foul in the penalty area. Substitution, Sheffield United. Conor Coady replaces Connor Dimaio. Substitution, Rotherham United. Haris Vuckic replaces Ben Pringle. Corner, Sheffield United. Conceded by James Tavernier. Attempt missed. Ben Davies (Sheffield United) right footed shot from outside the box is too high. Substitution, Rotherham United. Wes Thomas replaces Tom Hitchcock. Substitution, Sheffield United. Louis Reed replaces Jose Baxter. Otis Khan (Sheffield United) wins a free kick on the left wing. Alex Revell (Rotherham United) wins a free kick in the defensive half. Attempt missed. Stephen McGinn (Sheffield United) right footed shot from outside the box is just a bit too high. Corner, Sheffield United. Conceded by Michael O'Connor. Substitution, Sheffield United. Otis Khan replaces Robert Harris because of an injury. Attempt saved. Harry Maguire (Sheffield United) header from the centre of the box is saved in the top centre of the goal. Corner, Sheffield United. Conceded by Craig Morgan. Corner, Rotherham United. Conceded by Matthew Hill. Foul by Stephen McGinn (Sheffield United). Corner, Sheffield United. Conceded by Kári Arnason. Substitution, Rotherham United. Michael O'Connor replaces Robert Milsom.